Spring is here and so are fungal diseases such as Take All Root Rot. The cool temperatures and extra rainfall during the spring months might be great for our gardens, but they also create the perfect conditions for certain fungal diseases. While a vigorous lawn and healthy soil can deter pests and diseases, even well-cared for lawns can succumb to aggressive diseases, such as Take-All Root Rot (TARR). TARR is an aggressive fungal disease that is infecting lawns all across North Texas. TARR is caused by a fungus caused by Gaeumannomyces graminis var. graminis. If TARR is left unchecked, it can quickly kill off large parts of your lawn, or even your entire lawn. St. Augustine, Bermudagrass, Zoysiagrass or Centipedegrass are all susceptible to Take-All Root Rot. Cool-season grasses such as Fescue and Rye are suceptible as well. For more detailed information about Take-All Root Rot, visit our Organic Advice section. TARR appears irregularly throughout the lawn. Your grass is slow to emerge in the spring. Young leaf blades often turn chlorotic (yellow or very pale green). These symptoms are often mistaken for general chlorosis (a nutrient deficiency) or chinch bug damage. Biggest difference between TARR and general chlorosis: Tarr will yellow your lawn in much less-uniform patches. Leaf blades yellow first then fade to brown. 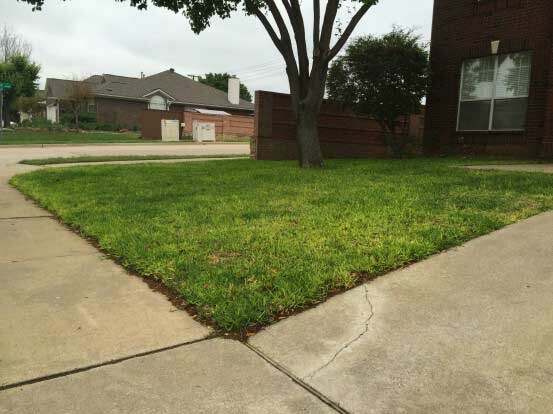 Large patches up to several feet across will die off in an irregular pattern (as opposed to defined or circular patches). The roots will also be dark brown as they begin to rot away. The leaf blades do not pull away from the stolon, like they will with Brown Patch. If you notice these symptoms, please call a professional lawn care maintenance team to properly diagnose and offer a treatment plan. TARR can be difficult to treat. The best prevention is good lawn care practices year-round including proper watering, fertilizing and mowing. For more detailed information about Take-All Root Rot, visit our Organic Advice section here. Be sure to visit our Resource section for details on various pests and diseases that could be ailing your lawn and landscape.